The riders wait around for the start. They didn’t have the kit then that we have now, but they’ve many things going for them that we have since lost. 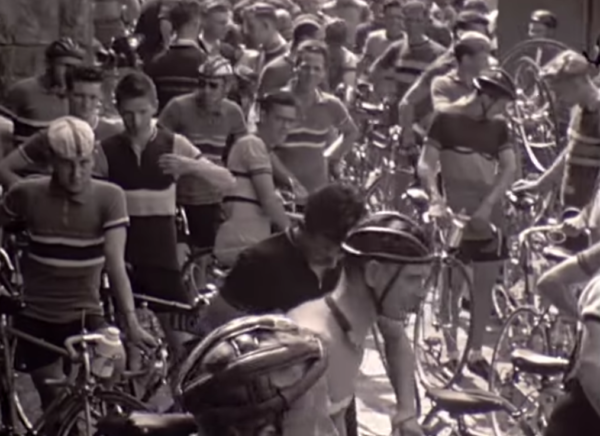 This fascinating 30-minute film of the Dun Laoghaire Cycling Week from the 1950s offers a real insight into what road racing was like in Ireland at the time. And one striking thing about it is how favourably the scene back then compares to road racing in Ireland in the present day. The racing, in 1955 and 1956, was run over a week and included a wide variety of events – from road to grass track contests and even a roller event. Most of it attracted very large crowds, with a grandstand erected for at least one of the races; something we’d never see now. And even the roller event was held in a town hall so crowds could come along and see the riders face-off. It was the 1950s answer to Rolla Paluza, indeed its striking how similar it is to that very popular modern-day format. Riders competed against each other on rollers, with their distance measured on a giant clock behind them so the crowd could see who was winning. The road races were also run on closed roads and were taken right into the centre of Dun Laoghaire, passing through the town each lap. And the location of those races brought out large crowds, compared to the present day when events are mostly held in the countryside, including the starts and finishes. The cycling week also had something else going for it that we’re often lacking now; a major sponsor in the shape of Raleigh. And judging by the number of journalists on duty it was apparently lapped up by the newspapers of the day. When it came to the grass track racing, the riders moved into the centre of Dublin; competing on the cricket fields in Trinity College. Today even our biggest events – like Rás Tailteann or the Junior Tour of Ireland – would struggle to get permission to finish a race in the centre of the capital. All in all, the status of road racing back then appears light years ahead of today’s scene. The racing in the 1950s seems to have been a real spectacle that was well organised, with Garda escorts, and well received by the public. A description on screen at the very start of the film reads: “The Dun Laoghaire Cycling Week was held during July and brought cyclists from all over Ireland and Britain into the town. “Bill Sleith was the main organiser of the event and owned a cycle shop in the town for many years.